Price per tube - 4 oz. A long day of work or a hard day at play may leave your skin looking and feeling dull and dry. Added moisture and deep cleansing is the obvious solution to restoring and replenishing your skin’s softness and natural texture. 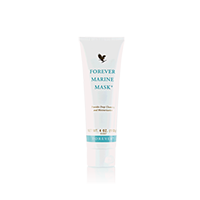 Forever Marine Mask® provides deep cleansing while balancing the skin’s texture with natural sea minerals from sea kelp and algae, plus the super moisturizing and conditioning properties of aloe vera, honey, and cucumber extract. This easy-to-apply, deep penetrating mask will leave your skin feeling refreshed and revitalized. Your skin will love the exceptional quality of the natural ingredients found in Forever Marine Mask!